So this is the new Vampire Lord? I wonder if it's replacing Vampire Nocturnus, or if this means Cemetery Reaper is out. I liked Cemetery Reaper. At any rate, it is nice to see a Vampire that plays off the traditional power of Vampires to convert other people into vampires and make them the head vampire's slave. Soul Collector was nice, but so is this. I do see a few problems with it though. For one, you need to tap five Vampires. Which means you need to get this and at least four other Vampires out onto the field. And of course, tapping them will leave you a bit short on blockers. And another problem: while it gives Vampires +1/+1 (regardless of the top card of your library), it's only a 2/2 itself. making it quite easy to kill. Oh, it'll be great when you live the dream, I'm just worried it won't happen enough. Captivating Vampire is the clearest indication possible that the tribe is here to stay. Designed on a similar template to M10 mainstays Elvish Archdruid and Goblin Chieftain, this lord is also fairly straightforward but offers the relevant decks an interesting extra dimension. I expect to see it on all manner of tables once it makes an appearance at the M11 pre-release (save some for me!). Welcome back readers today's card of the day is a throwback to the tap five creature types effect. 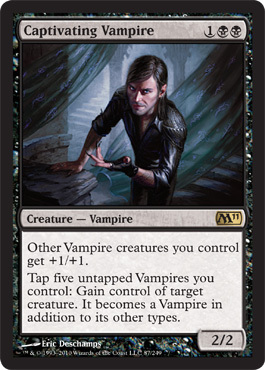 Captivating vampire is a decent sized 2/2 body that is a lord for your other vampires, the fact the creatures you steal become vampires is highly flavorful and the fact they get boosted is great. In standard five creatures is a lot to commit to the board, maybe if there was a way cheap and effective way of pumping out vampire tokens I would consider this. Otherwise nocturnus is in most cases better, but is rotating so we face a conundrum. Vampires I don't feel need the support in standard even with the loss of nocturnus they will be a relevant and powerful tribe. In extended once again getting five creatures is a chore but if you do achieve you can tap all your creatures and steal it from opponents before they launch their mass removal, vampire based decks mostly revolve around hexmage here so im not sold on this card. In casual and multiplayer this card is amazing stealing all your opponents creatures is good, combine with Awakening or similar cards to untap all your creatures and repeat. In limited its hard to draft around a tribe without drafting a subpar deck I would avoid this card unless it becomes a money draft. Today's 2011 card of the day is Captivating Vampire which at three mana is one less than the previous lord for the vampire clan, Vampire Nocturnus. Unlike Nocturnus this lord always applies a bonus of +1/+1, but has an even less reliable secondary effect as having five creatures in play of a specific type untapped is a tall order. Even ignoring the second effect this is a very playable addition to an already strong family and will be played for at least as long as Vampire Nighthawk is around. For Limited the value of lords is often less than the constructed formats due to the lack of creatures in the correct type. This isn't an exception for Captivating Vampire as the second effect in particular would be unlikely to be activated in a Limited game. The full setlist for 2011 isn't available at this time, but 2010 had only three different vampires to choose from and only three have been revealed for 2011 so far. If you can get several other vampires as support this isn't bad, but that depends heavily on very specific conditions of packs and for booster the table around you as well. You may draft this as a rare or hate, but without other vampires it is just a three mana 2/2.